Since first bottling in 2002, Sterhuis in the Bottelary ward of Stellenbosch has developed a reputation for unfussy yet worthy wines, the Chardonnay Barrel Selection a particular standout. 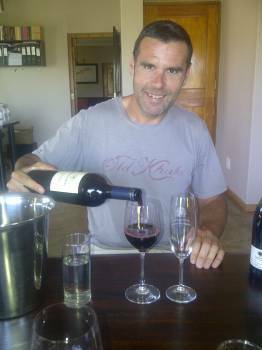 Winemaker Johan Kruger has now attempted a Pinot Noir and has again come up with a wine which at R150 a bottle won’t leave you feeling short-changed. From the 2013 vintage, grapes were sourced from Spioenkop in Elgin, the wine made by spontanteous fermentation and matured for 11 months in French oak, none new. Red and black cherry plus a hint of reduction which is a point of interest rather than a flaw. An impressive core of fruit, bright acidity and fine tannins. Perhaps a little short on complexity but it tastes proper – it’s not tutti-frutti on the one hand or over-bearing on the other. Only 1 500 bottles made so move fast. Friday 13 May 2016. Enjoying my first ever bottle of your 2013 Pinot Noir. Luckily I am enjoying it all on my own so I do not have to share..Enjoying some good Latin Jazz as well so this is a great Friday 13th.